See how Litespeed bikes are built in Ooltewah, Tenn.
Don Burton applies decals to a finished Litespeed mountain bike while at the American Bicycle Group headquarters in Collegedale, Tennessee. Don Burton applies decals to a finished Litespeed mountain bike while at the American Bicycle Group headquarters in Collegedale, Tennessee, on Tuesday, November 11, 2014. 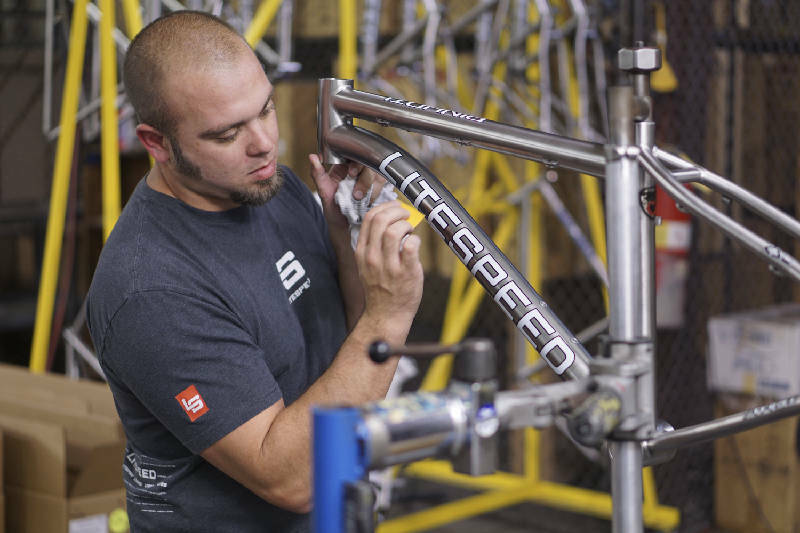 Taking hand to metal in order to build Litespeed bicycles is a labor of attention and, at times, repetition. 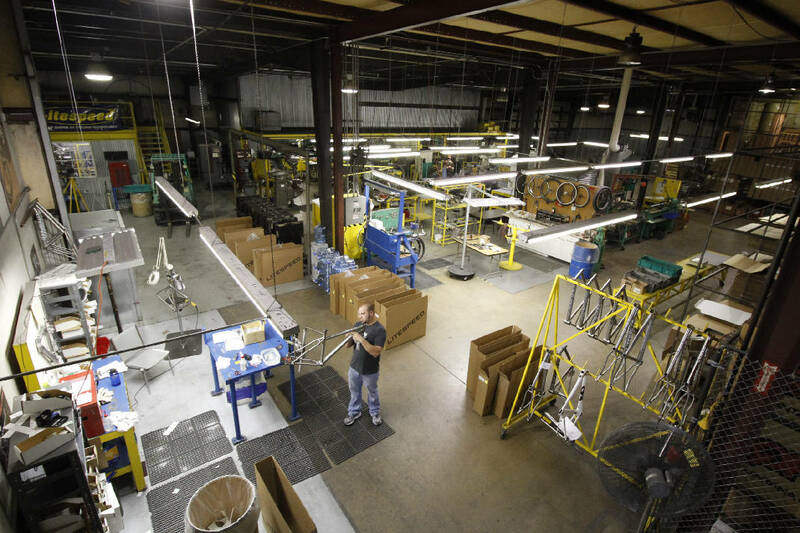 The team that turns titanium into bikes at American Bicycle Group's Ooltewah headquarters is 32 strong. They design and cut and bend and weld. They check measurements, and then check them again. They even make the tools that are used to build the bikes. Staying on the cutting edge of the two-wheeled world means that the company's bicycle design is always evolving. "I have to make subtle changes to accommodate for components" being released in the industry, says Brad DeVaney, American Bicycle Group's head of product design and development. 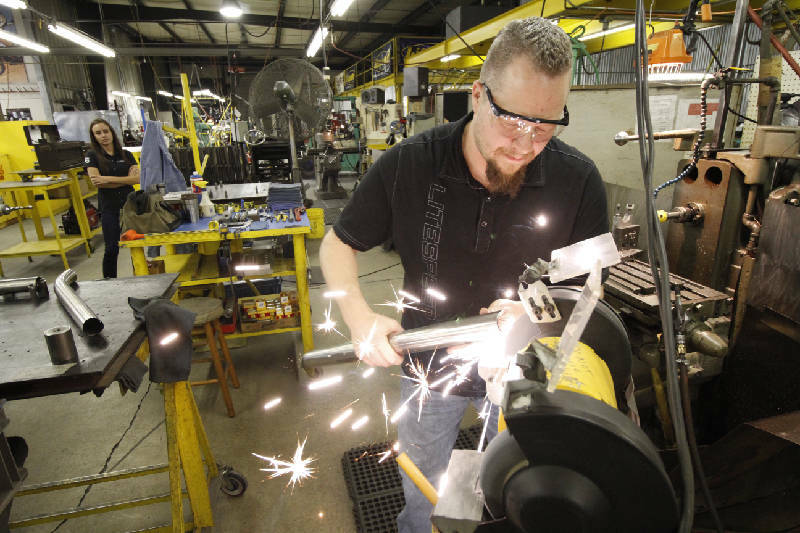 Components have changed more rapidly in the past five years than in the past two decades, says DeVaney, who has been part of the business just as long. DeVaney's creative work includes asymmetric frame design to improve aerodynamics and power transfer. His designs were the first to utilize asymmetry. Step 1: David Haight miters and prepares titanium tubes that will become the top tube, the part of the bike frame that goes between the front and back wheels. David Haight miters and prepares titanium tubes that will become the top tube, the part of the bike frame that goes between the front and back wheels. Step 2: Steve Grubb uses an arbor press to shape titanium tubes into chain stays, which connect the rear wheel to the pedal area. 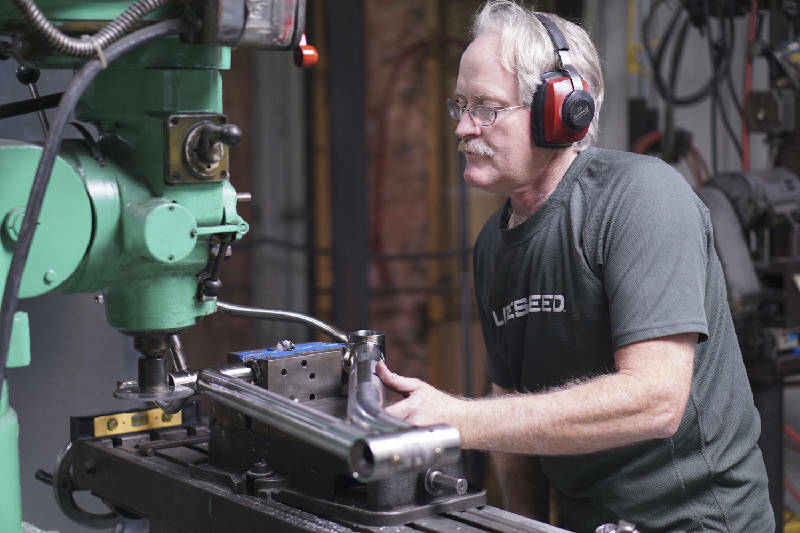 Steve Grubb uses an arbor press to shape titanium tubes into chain stays, which connect the rear wheel to the pedal area. Step 3: Grubb's work turns the long shiny tubes, like the one on the right, into chain stays, like the one lying next to it on the left. Tools lie farther to the left. Grubb's work turns the long shiny tubes, like the one on the right, into chain stays, like the one lying next to it on the left. Tools lie farther to the left. Step 4: Michael Willoughby welds titanium chain stay tubes into a rear end, which is where the rear wheel attaches. 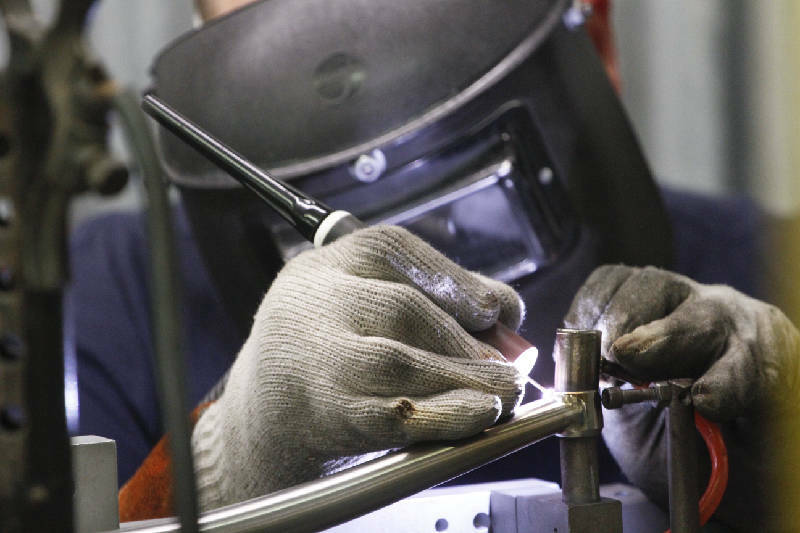 Michael Willoughby welds titanium chain stay tubes into a rear end, which is where the rear wheel attaches. Step 5: Ron Upchurch cuts a notch in a seat tube, so that a rider can adjust seat height. Ron Upchurch cuts a notch in a seat tube, so that a rider can adjust seat height. Step 6: Chuck Woy applies a brushed finish to the bike frame. Chuck Woy applies a brushed finish to the bike frame. Step 7: Don Burton applies decals to a finished bike frame. Don Burton applies decals to a finished bike frame. This story originally appeared in Edge magazine.